During the week or so we've been back in Teton Valley, Idaho, it has snowed a lot. And then the last two or three days it started melting. 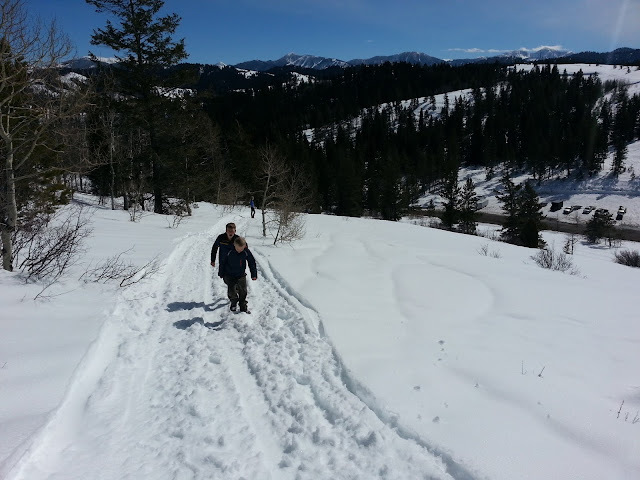 Yesterday (Saturday) was beautiful and sunny.I took the kids on a short hour-and-a-half trip to hike on the snow north of the top of Pine Creek Pass. We started out walking on snowmobile tracks and when we reached the end of those, we headed out on virgin snow. Mostly the snow was firm enough that we only sunk in a little, with a few exceptions.We saw lots of snow fleas in some areas, and since it's always windy up there, some areas were windblown and rocks and scrub showed through, while in other areas there were deep drifts.We started at elevation 6726 feet (2050 m) and topped out at 7316 feet (2230 m). It was bright and beautiful and even though we weren't out that long we got slightly sunburned thanks to the sun reflecting off the snow!